You can see immediately from the cover that this is no ordinary popular science book. There are some issues with The Compelling Scientific Evidence for UFOs, but if you have an interest in the field, particularly if, like me, you are an open-minded sceptic on the subject, I would consider reading it. 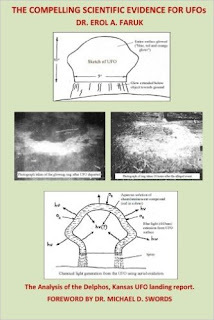 This is because it is one of the few attempts to use proper scientific methods on UFO evidence, and though I don't agree with Erol Faruk's conclusions, it is refreshing not to see simplistic acceptance or knee-jerk denial of what is, for many people, a genuinely interesting topic. This isn't a general discussion of the UFO phenomenon - for that I'd recommend How UFOs Conquered the World by David Clarke, but instead gives us the author's take on a specific incident at Delphos, Kansas, where an alleged UFO landing left behind some very interesting material. The book has as an appendix made up of Faruk's scientific paper describing an analysis of the unusual organic material found, and some suggestions as to what it might be, and a main section that gives background to that paper and repeats a lot of the non-technical content. The format doesn't work wonderfully well, because we start with 80 pages of introduction, then get 40 pages of the paper, which repeats a lot of what came before. By far the most interesting part is Faruk's analysis of the material, which is detailed and does show some unusual properties. We aren't talking the usual X-Files stuff of 'unknown substances' or 'alien material' - these are straightforward, if complex organic compounds, but they are unusual ones with interesting water repellant and fluorescent properties, which Faruk suggests could be indicators of previous bioluminescence. What is this stuff and where does it come from? Faruk suggests it was material left behind when a UFO landed, leaving a circular mark on the grass. His book opens with an overview of the UFO phenomenon. This could be more balanced - at the moment it merely presents the 'believers' view and places far too much dependence on witness testimony. Although the author makes it clear that the best evidence is not about seeing lights in the sky - which are very common and often optically misleading - but seeing clear, detailed craft. Yet he doesn't really explain why in one of the best documented examples he gives where ‘hundreds, possibly thousands of witnesses’ say they saw a craft at Phoenix in 1997, there are no good photographs of anything other than... lights in the sky. We then move onto the Delphos incident, with a description of what was reported, the evidence to support this, an overview of Faruk's analysis of the material and a series of attempts to get his paper on the subject published in a non-specialist journal, including Nature. It does no benefit to Faruk's argument to show us a series of email exchanges with journals where they reject a paper for what seem to be perfectly sensible reasons, but which are taken to be something close to suppression. Finally we get the paper itself. With any experience of journals like Nature, it's easy to see why it was rejected. The 'science' part of the paper is fine, but the long opening background section with links to Wikipedia as sources would put off any mainstream scientific journal. 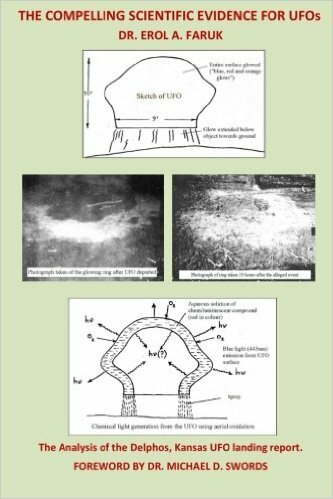 As for the analysis, the problem is the leap from the genuinely interesting chemical analysis to the assumption that this vindicates the story of a UFO landing. The other evidence is mostly a family's testimony, plus a single Polaroid photograph said to show the ring where the UFO landed glowing in the dark. (It just looks like a ring of white material in the photo as printed - hardly useful evidence.) Faruk suggests that the existence of material he analyses could be the result of a hoax, a fungal ring or a UFO, and comes down in favour of the third option. But of itself there is no reason to make the leap to UFO other than the witness testimony - there are plenty more possible reasons for the existence of this material. It's strange, for instance, that Faruk doesn't mention the suggestion easily found online that a galvanised iron chicken feeder used to stand where the ring is, and that the ring is where chicken droppings accumulated for years. So, a frustrating read, not delivering the compelling evidence promised. But I very much support the author's attempt to put UFO studies on a proper scientific basis, rather than leave reports of sightings and landings to be either lapped up uncritically or dismissed without any consideration by a sometimes heavy-handed scientific community.